Home » Our Blog » You Have an Impacted Tooth. Now What? >How did this happen? Could you have done anything to prevent it? When it comes to tooth impaction, rest assured there is likely nothing you could have done to prevent it from occurring. Unlike cavities and gingivitis, which can be averted with proper brushing and flossing, an impacted tooth can happen in even the healthiest of mouths, causing pain and wreaking havoc on your smile unless properly treated. A tooth is considered impacted when it cannot properly erupt the jaw bone and gums as it is supposed to. Instead, the teeth remain trapped completely or partially below the surface of the gums. Although impaction can happen to any tooth, it is most commonly seen in adults when their wisdom teeth fail to ‘come in’. As the last four of the 32 adult teeth to emerge, the wisdom teeth are often left with little space in the jaw. In their attempt to emerge, the teeth may shift out of place, or they may even become twisted or tilted. It is important that a dentist diagnoses an impacted or partially impacted tooth. While some fully impacted teeth may cause no symptoms or complications, partially impacted and some fully impacted teeth can cause serious oral health complications. Aside from uncomfortable symptoms, partially impacted teeth can harbor food debris that is difficult to remove when brushing and flossing. Impaction can also cause surrounding teeth to shift, creating problems in tooth alignment that increase the risk of tooth decay and gum disease. In some cases, an impacted tooth can also become abscessed or infected, which can present a much more serious health issue. If you are diagnosed with an impacted tooth, your dentist may or may not recommend treatment depending on your symptoms and any possible oral health issues the tooth may cause. If you are recommended for treatment, this could include an antibiotic for the treatment of any potential infection, as well as surgical removal of the tooth. Since the wisdom teeth become impacted more than other teeth, dentists often recommend their removal early in life before they can cause complications. 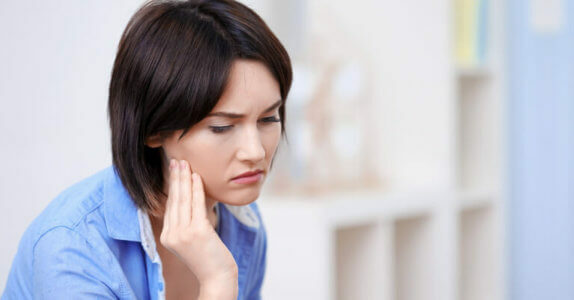 Often, impacted wisdom teeth are removed during early adulthood when the tooth roots are not fully developed and it is easier to heal and recover from the procedure. The easiest way to find out if your teeth are impacted is to schedule an appointment with your Houston dentist here at Briter Dental. An x-ray and exam can quickly reveal the presence of any impaction and potential indications for treatment. For more information or to set up your appointment, contact our office today.